Thomas is a member of the Global Board of Arthur D. Little and the Managing Partner of Arthur D. Little Middle East. He serves telecom operators, ministries and other public organizations, and family conglomerates. 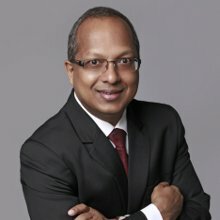 Since joining Arthur D. Little in 1998, Thomas has been actively involved in complex strategy development, organization design and transformation projects across the Middle East and South East Asia to deliver significant and tangible impact – not just for his clients but also at a wider, national level. His passion and commitment for providing the best value on all his projects acts as a key guiding principle for the entire office. Prior to joining Arthur D. Little, Thomas worked at Larsen & Toubro as an Industrial Automation Engineer. He was also selected as a Pilot Officer with the Indian Air Force. In addition to consulting, Thomas regularly teaches various management courses (International Business Strategy, Family Conglomerate strategy & Strategy Consulting) at different MBA schools across the globe. Outside work, Thomas spends time on natural (not organic) farming and Ayurvedic plants.